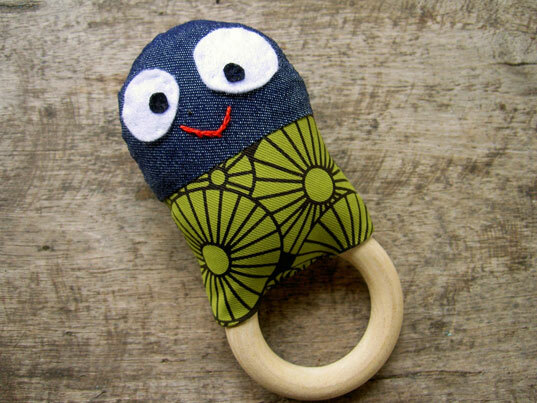 Looking for a fun eco-friendly baby gift or another way to get your little one to smile? Chunky Chooky delivers with Funky Rattle Teethers, which have names like “Mr Raaar Raar” and “Mr Smirky.” Each one is handmade by an Australia-based Etsy designer using recycled fabric from her furniture upholsterer neighbor, remnants from local designers, eco felt and upcycled clothing from friends’ wardrobes. Looking for a fun eco-friendly baby gift or another way to get your little one to smile? Chunky Chooky delivers with Funky Rattle Teethers, which have names like "Mr Raaar Raar" and "Mr Smirky." Each one is handmade by an Australia-based Etsy designer using recycled fabric from her furniture upholsterer neighbor, remnants from local designers, eco felt and upcycled clothing from friends' wardrobes.